I grew up in a Southern mill town. Such towns come in one of three primary flavors: tobacco, textiles, or furniture. My hometown was a textiles town, the home of several major textile companies over its roughly 220 year history. As a fellow writer who’s also an Eden native once put it, most of the population of these towns worked in one “good Bastille” or another. Of course, that’s all gone now. Like most Southern mill towns, Eden, NC, is a town struggling to find an identity even as it struggles to survive. Because two rivers ran through my home town, the place was ideal for 19th century textile development. Probably my home town’s most famous (part-time) resident was the guy who brought textile manufacturing to the area, John Motley Morehead. While Morehead, as noted, did not live full time in “the Tri-Cities,” as the area was once known (if an area with a total population – even now – south of 20,000, should presume to such a moniker), he did maintain a house there which he used when visiting his holdings. Several of his descendants did live in the area, however, and even today members of the Morehead family own holdings in Eden. The high school, hospital, and a popular park are all named for one Morehead or another. 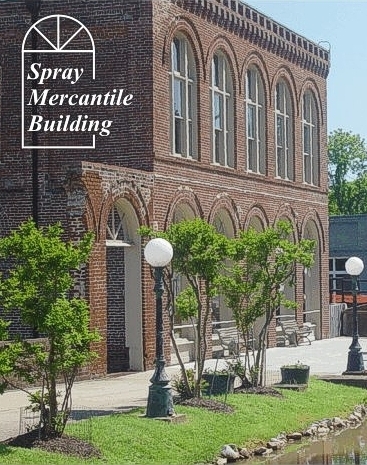 The founding and history of the other two towns, Spray and Draper involve other names well known in North Carolina textile industry history – Mebane, Marshall Field, Chatham – all played a role in the history of what is now Eden. Perhaps the largest role goes to Marshall Field who built the planned mill village of Draper as well as the section of Eden where I grew up, another planned mill village called, creatively enough, New Leaksville. Mostly these villages consisted of 3-4 room “mill houses” as they were known in my childhood with, scattered here and there, the occasional nicer bungalow for supervisors and other management or staff employees of whichever corporate entity controlled the mills at a given point in history. Ancillary characters such as neighborhood merchants usually had homes similar to those of of mill supervisors although notable successes were able to build residential monuments to their success of finer quality. The “documentary inventory” section of this book records the sorts of details I mentioned above. What is interesting to me (and would be for any reader interested in social history), is what they choose to document.The “pictorial history” focuses primarily on three sections of what is now the city of Eden: Old Leaksville, the part of town founded by Leak and sustained by a range of enterprises and inhabited in the majority by families with the longest pedigrees as residents of the area; the Highlands, a well-to-do- residential area abutting Old Leaksville and inhabited by senior mill officials, physicians, high level educators, and other professionals; and Matrimony/Oakland Heights, a preferred residential area for successful merchants and business persons not affiliated with the mills. The houses described range from large plantation homes and mill owner mansions to formula built mill shacks and farm houses. The care which the authors – and their sponsor the Eden Preservation Society – take to include representative dwellings of every type (including some wonderful information about the African American neighborhoods in each section of the city) is admirable both as social psychology and history. The pictures of houses and their accompanying descriptions, though dry, sometimes offer anecdotes and folk history. These gems provide insights into the lives my ancestors and their families, friends, and neighbors lived. They also provide a message for the insightful reader that perhaps even the Eden Preservation Society does not realize. That message is this. When those who owned and managed the mills lived among those who worked in them, that physical closeness bred a sense of community and mutual appreciation. Once that ownership moved far away or sold its interests to owners unconnected to the community, that relationship was ended and decisions that were beneficial from a business standpoint but harmful from a social standpoint were easier and easier to make. It’s the story of the last 40 years I referred to earlier: it’s good business to liquidate assets advantageously whether they be products, infrastructure or personnel. And it’s easy to do so when one doesn’t have to look those liquidated assets in the eye as one’s ancestors did. I visited my home town a couple of weeks ago in the midst of reading this work. Some of the mills – as well as my old elementary and junior high schools – have had their historical site designations reversed and have been torn down so that their heart pine flooring and vintage brick could be sold and “recycled” into luxury home construction for the sorts of people who used to live in towns like mine but who now, in the Age of Financialization, demand high returns on their investments no matter what that does to people in home towns like mine. My home town is a place in need of funds now that the tax base that supported it has migrated offshore to maximize investor returns – and reduce labor costs. The decision to sacrifice town history for survival was, by the measures we use to assess such decisions in our country, sound business. Calvin Coolidge’s most famous, most often cited quote is “The business of America is business.” Maybe, just maybe, America should make its business asking Tolstoy’s question: How much land does a man need? I agree, in principle, that not living around those whom you are laying off from work makes laying them off easier, but in the case of textiles, I don’t think this would have made a bit of difference. The fact is, it became cheaper to move textile manufacture to low-wage nations — some of which were much nearer to high-quality raw materials — and import them to the US than to manufacture them here. Once that became a reality, there was no way the textile mills could survive, short of imposing high tariffs on imported textiles. But high tariffs lead to retaliatory tariffs, and that means, essentially, that Boeing and the Pacific Northwest would lose jobs to maintain the textile jobs in the South. Plus, US citizens would be paying a great deal more for textiles than they pay in most of the rest of the world. To my way of thinking, the people who failed were the citizens of these counties, who starved the school systems for money when there was plenty of money to be had. To this day, my county has the lowest, or one of the lowest, mil levies of any county in Virginia. It didn’t have to be this way. Everyone thought the tobacco and textile money would last forever, and failed to react. Maybe my area will recover, but I doubt it. To this day, there is a strong feeling there that education (usually called “book learning”) just doesn’t matter, and attempt to upgrade the education system have met, again and again, with determined resistance that have scuttled reform efforts. My grandfather, William Merritt Clarke, worked hard to bring prosperity to Draper. He had a general store where he helped many people survive the depression. He was influential in bringing the mills there, having the Methodist Church built in Draper & the hospital where his son, Len Gordon Clarke, MD. practiced. My mother, Nellie Jean Clarke, was born in 1919 in Draper. Her mother, Adele Pattillo Clarke, took food to & taught art & music to mill children & had three sons after my mom…William (Bill), L.Gordon, & Herbert. She was a Deaconess in the Methodist Church after my grandfather requested the denomination send someone to help the congestion grow. That’s how they met. , of course. My mother is Gerry Bolick Clifton. Wow! Thanks for your comment. I’m so glad you remember Adele Pattillo Clarke. We lived far away so I missed growing up near her. I admired her & I see some of her characteristics & artistic talent in myself, my daughter, & granddaughter.